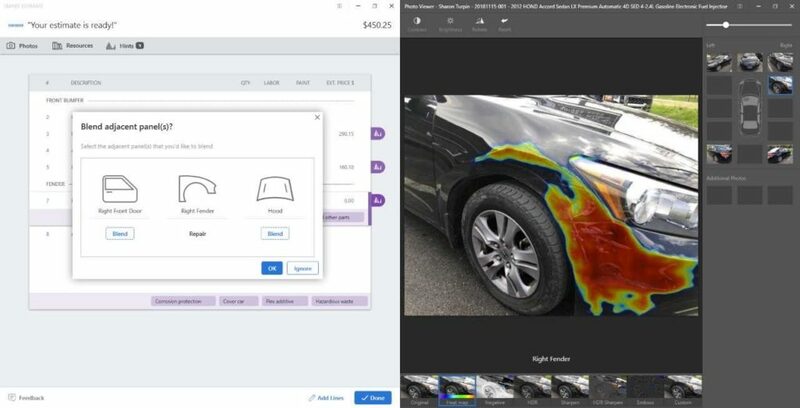 CCC on Monday said some insurers were testing its artificial intelligence photo estimating system Smart Estimate, which it planned to start selling to all car carriers in the first quarter of 2019. 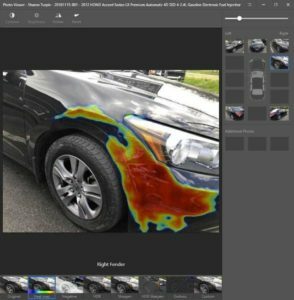 The software analyzes images of crashed cars and automatically populates an estimate with the parts it determines to be damaged. The system can also predict whether the part is repairable or needs replacement based on a combination of estimating logic and the lessons of countless past CCC estimates, CCC product management Senior Vice President Jason Verlen said Monday. Smart Estimate fits a trend of claims originating from software on a customer’s smartphone, a category Verlen said had “skyrocketed in a year” from 1-2 percent to about 10 percent, he said. “Things are moving fast,” he said. When CCC opens sales of Smart Estimate in the first quarter of 2019, it will allow carriers to elect if they want damaged parts to be prepopulated as repair or replace operations, according to Verlen. The A.I. also has the ability to make repair or replace calculations itself now, but Verlen said CCC isn’t going to deploy this third option yet. Verlen said Smart Estimate can be used two different ways. One format delivers a “write what you see” description capturing the external damage noticed by the A.I., according to Verlen. It’s up to supplements to record additional damage. Another option — a feature Verlen said would be available at launch — attempts to predict what else has been damaged inside the vehicle too. Verlen said he thought that as confidence grew in the A.I.’s abilities, users would decide to just simplify things and let the A.I. take the estimate to a deeper level. “It’s a process,” he said. Verlen also noted that having the A.I. stick to exterior estimates might avoid a form of sticker shock. Some insurers might be used to one severity level from initial estimates focusing on visible damage only, and they might balk when an A.I. configured to predict internal damage as well inevitably starts generating higher initial estimate totals, according to Verlen. Over time, however, the carrier might decide that having a more complete estimate up front made more financial sense than discovering and investigating supplements down the road, Verlen said. Verlen has stressed that carriers shouldn’t completely remove their adjusters from the equation. In the Nov. 2 IDEAS Collide talk, he said a user would get the most value out of Smart Estimate by pairing the A.I.’s output with a human being. As he described it, the software saves time by handling the scut work of populating the obvious damage; the human only has to worry about refining the estimate. But would human nature or a heavy claims workload lead adjusters to just rubber-stamp the A.I.’s draft to move on to the next claim? We asked CCC if the estimates developed during the current testing were indeed seeing the human input Verlen encourages. Verlen said that while some A.I. estimates were getting automatically approved, generally, “there is at least some minimal interaction.” CCC has noticed estimators capitalizing in particular upon the remove and install operation hints the software provides and adding those R&Is to the sheet, according to Verlen. 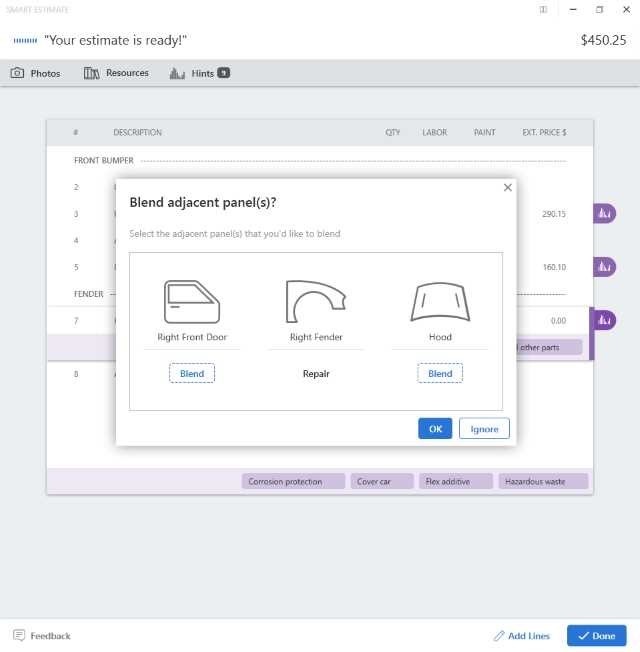 An example of such a hint can also be seen in this screenshot; the system prompts the adjuster to consider if adjacent panel blending is necessary. CCC was well-positioned to develop a system like Smart Estimate given the 100,000 claims passing through its software each day. Artificial intelligence can draw upon patterns in large data sets to draw conclusions. However, developing the system wasn’t as simple as just feeding all of CCC’s historical database of estimates with photos into the system and turning the A.I. loose, according to Verlen. Data curation was necessary. Many photos in CCC were taken before the use case of photo estimating arose, and a great deal were “quite frankly, useless,” Verlen said. CCC actually had to develop another artificial intelligence to weed out unsuitable images for the Smart Estimate A.I., he said. The company also refined the set by time periods, to avoid anything “ridiculously old” being considered by the software, and it looks for generational changes which could pose an issue. Ironically, the aluminum F-150 ultimately didn’t prove that significant a factor for CCC’s software to accommodate, Verlen said. But CCC has the capability to restrict the software from attempting A.I. estimates on a particular next-generation vehicle model year until it builds up enough of a database to teach the A.I., he said. “I don’t think we’re using it right now,” Verlen said of the ability to limit deployment by model year. The fusion of A.I. and estimating logic used in Smart Estimate explains why the F-150 wasn’t as disruptive to CCC’s platform. The A.I. is examining whether a part is damaged or not and the extent of that damage, according to Verlen. The effects a part’s metallurgy has on the repair is an estimating logic question, he said. “The damage detection is still the same,” Verlen said. CCC Quick Estimate, which includes video chat and a mobile app to quickly submit claim information. CCC Smart Audit, which flags items on claims deserving a look by a human being. CCC Smart Total loss, which can with a single photo determine if a car is a total loss with more than 90 percent accuracy. Damage Detection, which automatically highlights all vehicle damage with a heat map consumers say they like. Though each piece of the suite can be purchased separately, Verlen said insurers tend not to pick and choose from it. Once the carrier makes the decision to go into mobile claims, they tend to adopt the package of software capitalizing on that technology, he said. Insurers are certainly interested in some form of digitization of the claims and estimate process, Verlen said. “Virtually 100 percent” of CCC’s conversations with insurers — ranging from local carriers to nationals — involves this issue. Some carriers might be further along than others, but the same economic drivers, such as increasing repair costs, are fueling the interest. “This is topic No. 1,” he said. Asked how quickly an insurer could adopt technology from the suite, Verlen said it depended on the application and how the insurer planned to deploy it to fit their particular niche. “We let you build your own differentiation around them,” he said. Smart Total Loss, for example, was easy to incorporate through an API or with CCC’s own app, according to Verlen. The question determining the speed of adoption was what the insurer planned to do with it, he said. Some carriers might just text a customer that their vehicle was deemed a total loss, while others might want to offer a “personal conversation” to distinguish themselves from competitors, he said. “You want differentiation,” he said.